The Feast of Our Lady of Guadalupe is a rich and beautiful account of the visitation of our Blessed Mother to a struggling new believer in a land where the Gospel of her Son was struggling agaisnt the paganism of the native Americans and the cruel greed and politics of a conquering world power. It was a setting with failure written all over it. Not unlike the the Church, Christ’s Kingdom today. But for the grace of God. I find many aspects of the story inspiring. 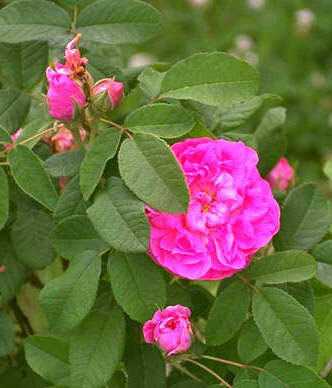 But as a gardener the Castilian Roses are of special interest. For the native American, Juan Diego, to find the roses, in December in Mexico and the for the roses to transform into the image of Our Lady provide a two-fold miracle whose power should not be lost on us today. Juan Diego found the roses in response to trust and a loving obedience. The blossoms of God’s grace bloom wherever fertile hearts are willing to allow the Light of the Gospel to shine. The external seasons, the climate (spiritual, moral) will have as much impact as God’s design and faith determine. One lesson is clear. The beauty of God’s grace and love longs to bloom in our hearts, our lives and our times as we but trust and have the courage to follow Him. what color were the roses of Our Lady of Guadalupe?